button opens the workout overview. It lists all exercises with sets, weight etc in one table. Tapping an exercise name in this table opens this exercise on the workout logging screen. Time on this button shows the total workout duration. i opens exercise description with pictures and animation, and also exercise history. The switch description/history is at the top of the screen. Tap < or > to go to the previous or to the next exercise. 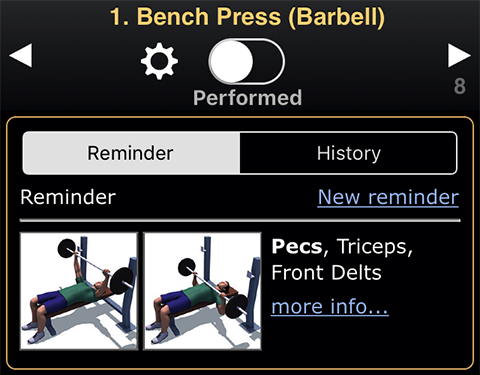 allows you to Insert Exercise that is not in this routine, to Finish Workout, to see details on the automatically calculated One Rep Max for this exercise, or to enter the Actual One Rep Max. History tab shows several last history records for this exercise. Note that some numbers are in bold font: set 2 on Nov. 8, set 3 on Nov. 1. These are your best sets – they made the highest One-Rep Max on that day. 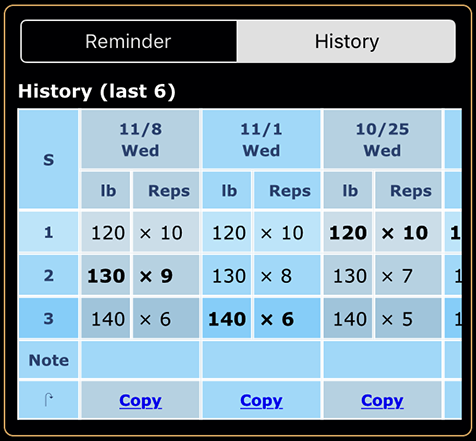 You can tap Copy at the bottom of the history table to copy numbers from the selected day to the current workout. GymGoal tries to find history records of the same exercise within the same routine. If this exercise is in several routines, GymGoal will not show records of workouts that were based on other routines. This is useful when, for example, the same exercise is in a high-weight-low-reps and in a low-weight-high-reps routines. If you want to skip this exercise – just go to the next one. If you are not skipping it – switch Performed on.